[article]: Regina's Kick Axe out to conquer U.S.
First, a personal message from Regina rocker Brian Gillstrom: "Say hello to all my buds in Regina. I've got a lot of them. About half the city. Just basically say we're having a good time." Gillstrom's passing on his best wishes long-distance from Nashville. He and the rest of the group Kick Axe had just played on a floating outdoor stage before 4,000 heavy metal fans as part of their tour to promote Vices, their debut album for Pasha Records. "This is paradise," said Gillstrom, sounding very relaxed. "Free booze, free pop. Everything you want. It's like paradise." Gillstrom, who handles drums and vocals, is joined in Kick Axe by his brother Larry and Ray Harvey on lead guitar and vocals; Victor Langen on bass and vocals; and George Criston on lead vocals. All the band is from Regina except for Criston, who's from Milwaukee. Morale's high, Gillstrom said, adding that he enjoys playing with his brother. "It's fun. It's fun to scrap with him. You can scrap and know you'll make up." Kick Axe began their American tour in Milwaukee, then played a Detroit club. That was followed by a red-eye overnight drive to Nashville, and now they're back in their van for dates in Halifax, Montreal and Toronto. They hook up with Judas Priest later this month in North Carolina. Along the way they plan to make a video. "It's really wild," Gillstrom said of life on the road. "You've got to experience it to really have a clue. Lots of ladies. Lots of parties. No sleep. Sleep's a waste of time." 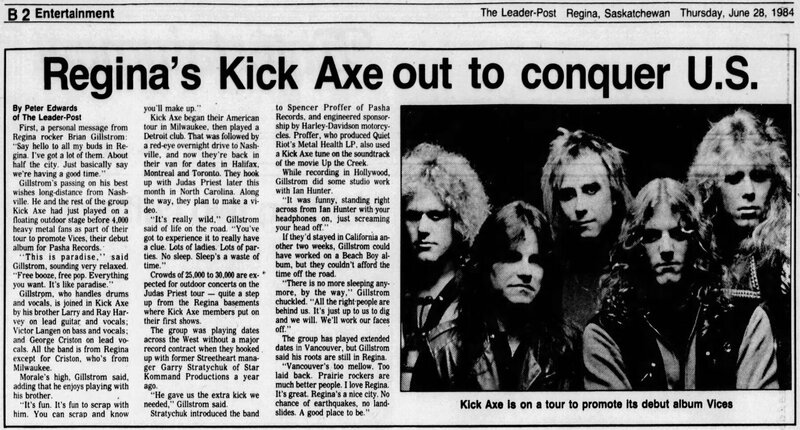 Crowds of 25,000 to 30,000 are expected for outdoor concerts on the Judas Priest tour - quite a step up from the Regina basements where Kick Axe members put on their first shows. The group was playing dates acroos the West without a major record contract when they hooked up with former Streetheart manager Garry Stratychuk of Star Kommand Productions a year ago. "He gave us the extra kick we needed," Gillstrom said. Stratychuk introduced the band to Spencer Proffer of Pasha Records, and engineered sponsorship by Harley-Davidson motorcycles. Proffer, who produced Quiet Riot's Metal Health LP, also used a Kick Axe tune on the soundtrack of the movie Up the Creek. While recording in Hollywood, Gillstrom did some studio work with Ian Hunter. "It was funny, standing right accross from Ian Hunter with your headphones on, just screaming your head off." If they'd stayed in California another two weeks, Gillstrom could have worked on a Beach Boys album, but they couldn't afford the time off the road. "There's no more sleeping anymore, by the way," Gillstrom chuckled. "All the right people are behind us. It's just up to us to dig and we will. We'll work our faces off." The group has played extended dates in Vancouver, but Gillstrom said his roots are still in Regina. "Vancouver's too mellow. Too laid back. Prairie rockers are much better people. I love Regina. It's great. Regina's a nice city. No chance of earthquakes, no landslides. A good place to be."